A holdover from an earlier time, the Pierce County community still prohibits the sale of alcoholic beverages by the glass. A proposition to change that is on the Nov. 3 ballot. 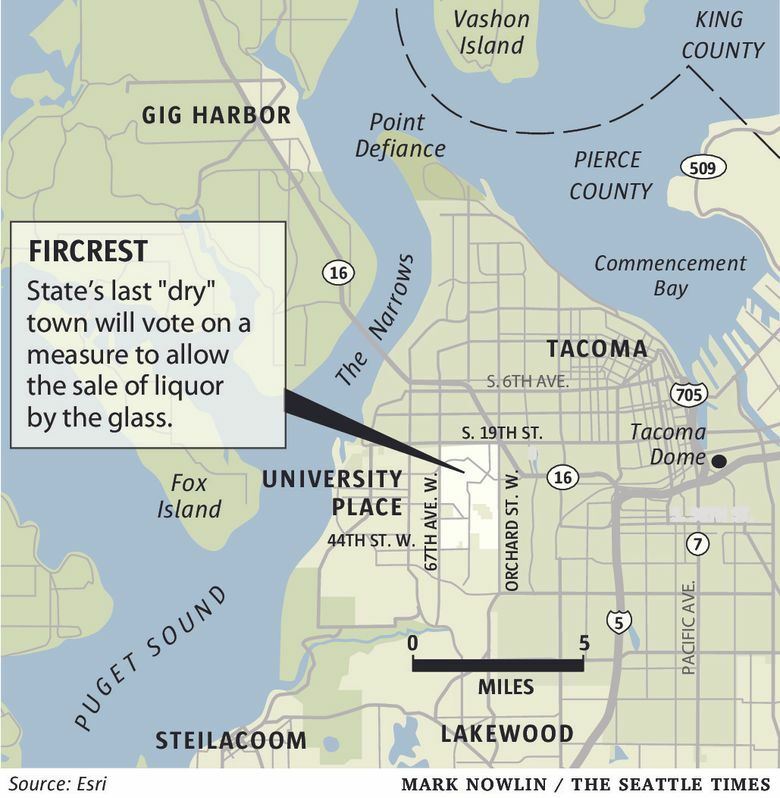 FIRCREST, Pierce County — Ninety years of being “dry.” The last town in this state where you can’t buy liquor by the drink. You want a mug of beer, a glass of chardonnay, buddy? You just keep going right out of the city limits. Tacoma and all its bars are a minute away. But modern mores have sneaked up on this bedroom community of 6,500 just west of Cheney Stadium. If you can’t sell liquor by the glass, it means no bars and no taverns, and less chance of a restaurant opening up. “We’re stuck back in time,” says Matt Jolibois, an accountant and City Council member here, and a backer of the ballot measure. He says it’s a reference to the town’s reputation as a speed trap. George also supports the proposition. For a while, the city couldn’t find anyone to write the “argument against” the liquor proposition in the voters’ pamphlet. That certainly was a change from 40 years ago, when a similar measure was put before voters and rejected by more than 60 percent. To produce those little decorative vases, the town had its own little ceramic shop, he says. Surina has collected historical photos of the town. Kids on a hayride. A boy getting a haircut, in an image right out of a Norman Rockwell painting. That’s how Fircrest saw itself. The town strove to separate itself as special by naming many of its streets after top universities: Princeton, Dartmouth, Yale, Vassar, Stanford. The town was founded by Edward “Major” Bowes and other investors. Bowes was famous in the 1930s and ’40s for a national radio program called “Major Bowes Amateur Hour” that featured such future stars as singer/actor Frank Sinatra and opera soprano Beverly Sills. Those investors originally named it Regents Park — as in the regents at a university — because they wanted to connect their planned community to education, says Surina. 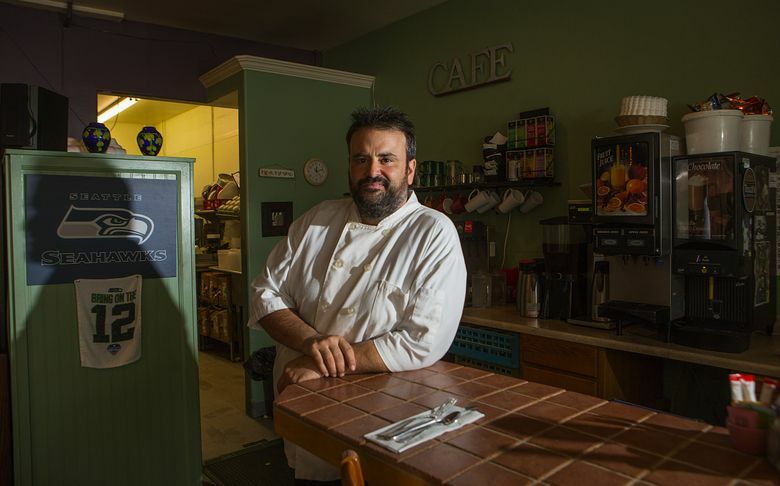 If the liquor initiative passes, the most direct beneficiary will be the Spring Lake Café, run by Scott Clement. Viafore’s, an Italian deli a few doors away, says it has no plans to sell liquor by the glass. At a cafe a few blocks away, T.W.O., the owner says she would contemplate selling alcohol. On a recent evening, Jill Absten says she’s had zero customers for the past hour and a half. Clement’s small, 12-table place in the center of Fircrest offers everything from the Home Town Breakfast ($7.95) to an Oktoberfest menu that includes such selections as Wiener schnitzel ($15.95). The latter was an influence of a Bavarian waitress at the cafe. “Of course, what you want with German food is German beer,” says Clement. Clement says that if the initiative passes, he wouldn’t stay open much past his current weekdays closing hour of 7 p.m. But he wants an even playing field with restaurants a short distance away that aren’t affected by the ban. “When I explain to customers that they can’t get a glass of wine or a beer, most people are shocked,” says Clement. He’s 47 and grew up in the area, attending nearby Foss High School and working in his younger days washing dishes at the private Fircrest Golf Club, where the chef taught him the basics of cooking. The golf club also is in the city, but it has always served liquor by the drink. That’s because it was annexed in 1995, but only after a special state law allowed alcohol to be served within Fircrest annexations. Two other areas later annexed got the same deal. It’s said that all politics is local. Here, it’s block by block. It was three neighbors who eventually banded together to write the “argument against” the initiative. They all live on Princeton Street, right behind the Town Center mall that’s on the main drag of Regents Boulevard. An empty supermarket that closed years ago is its most prominent feature. One of the neighbors, Ken Porter, a retired metallurgical engineer, says he was at the meeting where it was announced that nobody had signed up to write the “against” part. Scott Brannon, another of the “against” neighbors, has worries. What happens if a brew pub goes in that empty supermarket? he asks. You mean, a beer garden? Jolibois, the accountant and council member, says that’s a good thing, that Fircrest should be more like British small towns. From there, that leads Brannon to discuss the garbage-can issue that has been bothering him. For Brannon, booze and garbage all tie in. So now what if the hypothetical brew pub comes in? More garbage, that’s what. Brannon knows he’s fighting a lonely battle. He says he talked to residents a block away from where the hypothetical brew pub could go in and found out he has few allies.